Thank you for purchasing HorseBiz! HorseBiz is an equine management software program that allows you to keep horse records, track horse activities, reports, planning calendars and more! HorseBiz has a multitude of features to manage every detail of your horse activities. Intuitive features mean first-time users and experts alike can maintain data effortlessly; it's easy to install and start using immediately. To further assist you in using HorseBiz, simply hold the mouse cursor over any field when in the Add or Edit mode and a brief description of how to use the field will pop up. For a more detailed explanation, use the Help icon. The fastest way to get started using HorseBiz is to review the sample data we have entered in for you. OCA Technologies, Inc. has entered four sample horses and their data for you to review. Take a few minutes to look at the information in each Folder, the address book and the Report and Pedigree sections. 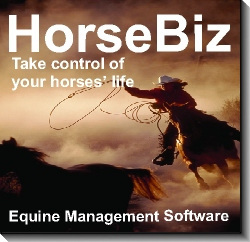 Reviewing the sample data will answer most of your questions about using HorseBiz software. Of course if you still have any questions our extensive online help will guide you. What to do when you are done reviewing the sample data and are ready to start entering your own horse information. To run Reports click on Report on the main menu and then View Reports. There are 41 different reports to choose from. will come up. There are many different options when printing reports. You can print all the records or specify a specific time period. You can print all the horse's records or one specific horse. Click on the report that you want and set the report criteria. When you are ready to view the report click the View Report button, the report runs and updates itself automatically. Once the report has run and comes up on your screen you can print it. To print the report click on the printer icon at the top of the form. You may also save the report to a file in many different formats, including CSV, RPT, Excel, Lotus and Word. This is consistent throughout the reports for all the folders. Go to PedigreeBiz to create new pedigrees, update existing pedigrees, do hypothetical matings and print out pedigrees. To create a pedigree, click on PedigreeBiz on the main menu and then View PedigreeBiz or click on the PedigreeBiz icon; you will be taken to the PedigreeBiz section. HorseBiz will bring over the horse's name, birth date, registration number, Sire and Dam and other basic information from the horse's record. PedigreeBiz has an auto-generating feature, which means if the Sire or Dam's pedigree information has already been entered in, the new pedigree will automatically create itself when you select that horse. To input pedigree records simply click in the field where you want to enter a horse. A pop-up box will appear giving you several choices: Add a new horse, Edit a horse, Delete a horse (This will delete the horse in ALL pedigrees so use this VERY carefully), Insert an existing horse and Move a horse to the beginning of the pedigree. To create hypothetical matings click on the HYPO button. Two dropdown boxes will appear in the Sire and Dam fields. Open a dropdown box by clicking on the down arrow in the box, a list of choices will appear. Click on the horse's name you wish to insert. Use the Print button to print a copy of the hypothetical mating. To move a horse to the beginning of the pedigree chart click on the horse you want to move. Click the Move button on the pop-up box. The horse you clicked on will be moved to the beginning of the pedigree chart. This feature is useful when building an extended pedigree for a horse. To print a pedigree click on the Print button. To print Progeny reports for both Sires and Dams, go to Reports and click on the Breeding folder. Your choices are to View Progeny of a Sire or View Progeny of a Dam. Both of these reports can be printed. When you are done in PedigreeBiz, click on the Return button to go back to HorseBiz. Please remember that when you make a change in PedigreeBiz, it will affect your HorseBiz records. For instance if you change the spelling on a horse's name that is also in HorseBiz, it will also change in HorseBiz. However, if you delete a horse in PedigreeBiz, it will not be deleted from HorseBiz but that horse will be deleted from all pedigrees in the PedigreeBiz database. If you encounter problems using HorseBiz that you cannot figure out from our Help files, you can go to our FAQ pages in the Chevalpub website. Free technical support is available for 30 days after purchase, to receive this you need to egister as a user (unless you purchased directly from OCA Technologies, Inc., then you will be automatically registered) by calling 281-677-8964 or emailing the following information to support@chevalpub.com. Please include your name, address, phone, license number, where purchased and price. After the 30 day free technical support period, you will be charged a per minute fee for telephone support. The per minute telephone fee is $15 for the first 15 minutes and $1 for every 1 minute after that. Charges must be placed on a credit card at the time of the phone call. Technical support is available 8:30 a.m. – 5:00 p.m. Central Standard Time, Monday through Friday. Please call to make an appointment if this does not fit into your schedule. Since OCA has found that more than 80 percent of current users have access to the Internet, it has expanded the web support available. OCA has also has set up a customer suggestion box that allows users to send feedback to the product development team. We thank you for being an OCA Technologies, Inc. customer and hope that this outlines our technical support policy thoroughly. The main screen is the only screen you will need for entering and editing horse records. Intuitive and easy to navigate, to add a new record you simply click on the horseshoe Icon or go under File and select Add A Horse. Need to find a specific horse's record? Just click on the Select Horse Icon and your list of horse records pop up, select the horse and that horse's records shows on the main screen. Throughout the program you will see pop up's on fields to give you hints and tips on what information to put there, just hold the cursor over a field for help. attached to a specific entry. Free form text area where you can keep track of other horse activities – trail rides, clinics, breed programs and more. This folder will work for people who want to keep track of outside mares they are breeding, stand stallions or send a mare out for breeding. You can do all three of these with HB! Select a Mare or Stallion to input its defaults to the pertinent fields you need to track such as Dates Bred, Wet/Dry, Foaling Date, and more. Do you know when your next shoeing date is? Don't worry about missing a trim or cutting it too close to a big show. Put yourself on a schedule, record the dates, charges and keep records from year to year. Keep track of feed costs, date purchased and what you purchased. Keep all of your equine insurance and inventory items in one area. Track premium dates, when an item was purchased, who from, cost and more. Organize your show results, dates, place, National Points and year-end awards. Use it to track a horse's progress from year to year or compare different riders (youth/open for example in western pleasure) or keep a favorite Judges list! You can even plan shows in advance by clicking on the Add button and inputting shows and dates to print out a calendar of events. Keep tabs on your show expenses and keep track of points, awards, and other notes. This section is useful whether you train horses for others, have your own horse out in training, or just want to keep your own show expenses. You can track by show, all the costs attributed to training/showing -- boarding charges, training charges, mileage, stall rent, entry fees, day charges, etc. Keep track of all your vet records, adding and editing entries at any time. Keep track of year end award information including class, result and awards for individual horses. Keep track of your Client's, Farrier's, Owner's, Trainer's and Veterinarian's names, addresses, etc. Backup your data records to a floppy disk. Enter many horse records at the same time. HorseBiz provides you with many varied reports to help you track your horse activities. Inserting your horse's picture is fun and easy. Make sure the picture of your horse is located on your hard drive. If the picture you want to use is located on a floppy disk or a CD copy the picture to a convenient directory on your hard drive. You can also copy the picture to the same directory you installed HorseBiz, but this is not required. Click on File and then select Insert picture. Select the directory on your hard drive where the picture is located. Click once on the name of the file which contains your horse's picture. Your picture is now inserted! To delete a horse picture simply click File and select Delete Picture. The picture will immediately disappear. If you ever move or delete the picture from the hard drive HorseBiz will no longer be able to display your horse's picture. If this ever happens simply re-insert the picture from it's new location. HorseBiz does NOT delete the picture from your hard drive. To insert a date click in any date field and a calendar will pop up. Use the calendar to select the month, day and year. To delete a date right click in an appropriate date field and the date will be automatically deleted. You may enter any date between January 1, 1900 and December 31, 2100. Although you may change any date you wish, there are several dates you may not delete. The reason you may not delete the date is that many of the reports require a date in order to function properly. Hold the mouse cursor over a date field to earn if you may delete that specific date. Again, you can always change any date you wish. To Add, Edit, Delete, Save or Cancel data, use the buttons at the bottom of each folder. Add: To add a new data record or horse record, click the Add button in either the Horse Folder or specific Folder, the fields will turn white and the cursor will be in the first field in the folder area. You can start entering data now. Edit: To edit an existing data record or horse record, click the Edit button, the fields will turn white with the cursor positioned in the first field. You can begin editing data in the white fields. Delete: To delete a data record, click the Delete button. There is no confirmation message when you delete a data record or event. To delete a horse and all its records, click on the delete button when you are in the Horse Folder. You will receive a confirmation message before the record is actually deleted. Click 'Yes' and that specific horse and all relating records will be deleted. Save: To save a data record or horse record, click on the Save button. Cancel: To cancel while adding or editing a data record or horse record, click on the Cancel button. None of the changes you made will be saved. Use the Master Record to track information that is not tied to a single horse. For example: Inventory items and Feed records. To view the Master Record, click on Master Record on the menu bar and then View Master Record. Records and items that might be put in the Master Record under the Feed Folder are hay, oats, supplements, minerals, the date each was bought and the cost. Use the notes area to keep track of other information that is specific to a purchase. Records and items that might be put in the Master Record under the Inventory Folder are not specifically related to single horse. Use this area to track purchase cost, purchased from, insurance premiums and notes on these items. When viewing the Master Record only the Feed and Inventory folders are accessible. Notes example: "Bought this load of hay from Mr. Brown, weighed 40 pounds a bale, cost $1.85 per bale. This was the first cutting, and a bit green." horses which came with HorseBiz. It will also delete the entire sample Pedigrees which came with HorseBiz. The Activities Folder is used for recording information about a horse which is not covered within the other folder topics. For example: trail rides, clinics, breed programs and more. The Breeding folder is used for recording mare and stallion breeding information. Using this folder you will be able to keep track of outside mares being bred, stallions being stood or sending a mare out for breeding. You may only enter breeding for mares or stallions. If you enter a Mare record and select a stallion in the bred to field, a stallion record will be created, thus eliminating duplicate typing. This does not work in reverse. Foaling Date- Use this field to enter the foaling date of the mare. Wet/Dry - Use this field to indicate if the mare's day charge is for wet (foal on side) or dry (no foal). Days Boarded - Use this field to enter the total number of days a mare was boarded. Day Charge - Use this field to enter the per day charge. The per day charge will be multiplied by the number of Days Boarded and added to the Total Charge. Breeding Charge- Use this field to enter the breeding charge for stallion services. Bred To - Use the drop down box to select the mare or stallion you bred this horse to. If the horse you bred to is not in the drop down list type it in. Reg. # - Use this field to enter the Bred To's registration number. Owner - Use this field to enter the Bred To's owner. Add Dates - Click this button to pop up a calendar to select the individual dates the mare was bred. Dates Bred - To delete an individual breeding date, double click the date. Close Cal. - Click this button to close the breeding calendar. Name- Use this field to enter the name of the farrier. You can enter as many farriers as you would like. Service - This field is used to enter the specific service provided by the farrier. We have included 3 general services typically provided by farriers; you can easily enter other services by simply typing the name of the service in the field. Next Due - Use this field to input when the next service is due. The Feed folder is used for recording feed types, purchase dates, and costs. A feed record can be tied to an individual horse or the Master record. Feed - This field is used to enter the specific feed type. We have included 3 general types of feed; you can easily enter other feed types by simply typing the name of the feed types in the field. The Horse folder is used for recording individual horse data. The Add, Edit, Delete buttons on this folder also control the top half of the horse record - Name, Birth date, Reg #1, etc. Reg#2 and Breed #2 - Use these fields if your horse is dual breed registered. Markings - Use this field to enter the horse's markings such as socks, strips, stars, etc. Height - Use this field to enter the horse's height in hands for example 15.2 hands. The Inventory folder is used for Inventory items, purchase dates, and costs. An Inventory record can be tied to an individual horse or the Master Record . To keep track of insurance on an individual horse, select the horse record and go to the Inventory folder. Under Category select Horses and under Item select insurance, then input the rest of the information. Category - This field is used to enter the Category of the Item. We have included three general categories; you can easily enter other categories by simply typing the name of the Category in the field. Item - This field is used to enter the Item of the Category. We have included general Items under each Category; you can easily enter other items by simply typing the name of the Item in the field. The Show folder is used for recording show information, show costs and event results. Travel Cost - Use this field to enter the total amount of expenses related to travel such as mileage, gas, food, hotel, etc. Stall Rent - Use this field to enter the cost of stall rental during a show. Entry Fees - Use this field to enter the total amount of entry fee charges during a show. Day Charge - Use this field to enter the total amount of trainer day charges if applicable. Bedding Cost - Use this field to enter the total amount spent on bedding for the stall during the show. Total Cost - This field automatically totals the Travel, Stall Rent, Entry Fees, Day Charge and Bedding Costs. Days Boarded - Use this field to keep track of total days boarded. An example of this use would be to input 30 days for a month of boarding. Boarding Charge- Use this field to track the boarding charge for days boarded. Per Ride Charges - Use this field to track the cost per trainer ride if applicable. An example of this use would be 10 rides per month at a charge of $10 per ride for an amount of $100. Training Charge - Use this field to input monthly training fees. The Veterinarian Folder is for recording veterinarian services and costs. To obtain accurate veterinary reports we have included Category and Item fields. The Category field a broad description of the kind of service provided; the Item field is a specific description of the service provided for that particular category. For example, Category is General, Item is Worming; Category is Breeding, Item is Palpating. Thus if you pick Category General you will not see Item Palpating. To ensure accurate reports, think carefully about each new Category you enter and its corresponding Items. For example, you would not want to enter the Item Palpate under both the General and Breeding Categories. Veterinarian- This field is used to enter the name of the veterinarian. You can enter as many veterinarians as you would like. Category - This field is used to enter the Category of the Item. We have included 3 general categories; you can easily enter other categories by simply typing the name of the Category in the field. Next Due - This field is used to keep track of when that specific Category and Item need to be done again. For example, Category General, Item Worming is done on a regular basis and would have a next due date. Category Emergency Item Stitches are not done on regular basis and would not have a next due date. Completed - If there is a Next Due date, then 'No' should be entered in this field. Once the Next Due service has been completed, change this field to 'Yes'. Continual updating of this field is necessary to ensure accurate veterinary reports. Association- Use this field to type in the name of the association giving the award. Class - Use this field to type in a particular class in which the horse received an award such as Two Year Old Halter Mares. Results - Use this field to input results of a particular class in which the horse received a year end award such as 1st Place. Award - Use this field to input what award was won for that particular class such as a plaque, ribbon and halter. The Event folder is used for recording specific show result information for an individual horse. To get to the Event folder you must first be on the Show folder and then click the Events button. Event Information for - This field pulls over the Show name from the Show folder. Event - Use this field to select a specific event or input your own. Place - Use this field to select a specific placing or input your own. Award - Use this field to select a specific award or input your own. Nat. Points - Use this field to select the type of national points or input your own. Points - Use this field to input the number of points or input your own. This icon will bring you to the address book. This icon will bring you to the reports section. This icon will add a new horse. This icon will bring you to the pedigree section. This icon will allow you to select a horse to work on. Click this icon to open the reports section. Click this icon to open the Pedigree section. Click this icon to Add a new horse. Click this icon to access the Help file. Click this icon to select a horse to work with. All Horses By Stallion - Use this report to run a listing of all the Mares bred by a specific stallion, you may select criteria by breeding year. Select A Horse By Stallion - Use this report to run a listing of a specific Mare bred to a specific stud, you may select criteria by breeding year. All Horses By Mare - Use this report to run a listing of all Mares bred for a specific year. Select A Horse By Mare - Use this report to run a listing of a specific Mare's breeding record. All Horses By Breeding Charges - Use this report to run a listing of Mares' breeding charges. Select A Horse By Mare Breeding Charges - Use this report to run a listing of a specific Mares' breeding charges. View Progeny Of Sire - Use this report to run a listing of a specific Sire's progeny. View Progeny Of Dam - Use this report to run a listing of a specific Dam's progeny. All Horses - Use this report to run a listing of all horses' Farrier records. Select A Horse - Use this report to run a listing of a specific horse's Farrier records. All Horses Services Due - Use this report to run a listing of all horses that have a Farrier Service due. Select A Horse Services Due - Use this report to run a listing of a specific horse's Farrier Service due. All Horses - Use this report to run a listing of feed purchases for all horses. Select A Horse - Use this report to run a listing of feed purchases for a specific horse. Master Record - Use this report to run a listing of feed purchases attached to the Master Record. All Horses By Show - Use this report to run a listing of all horses' show records. Select A Horse By Show - Use this report to run a listing of a specific horse's show records. All Horses By Event - Use this report to run a listing of all horses' horse show event records. Select A Horse By Event - Use this report to run a listing of a specific horse's horse show event records. All Horses By National Points - Use this report to run a listing of all horses’ national points. Select A Horse By National Points - Use this report to run a listing of a specific horse's national points. All Horses By Expenses - Use this report to run a listing of all horses' horse show expenses. Select A Horse by Expenses - Use this report to run a listing of a specific horse's horse show expenses. All Horses by Year End Awards - Use this report to run a listing of all horses’ year end awards. Select A Horse By Year End Award - Use this report to run a listing of a specific horse's year end awards. All Horses - Use this report to run a listing of all horses' training records. Select A Horse - Use this report to run a listing of a specific horse's training records. All Horses - Use this report to run a listing of all Horses' Veterinarian records. Select A Horse - Use this report to run a listing of a specific Horse's Veterinarian records. All Horses Services Due - Use this report to run a listing of all horses that have a Veterinarian Service due. Select A Horse Services Due - Use this report to run a listing of a specific horse's Veterinarian Service due. There are two Activities reports. All Horses - Use this report to run a listing of all horses' activity records. Select A Horse - Use this report to run a listing of a specific horse's activity records. There are four horse reports. All Horses By Owner - Use this report to run a listing of all horses by owner. All Owners By Horse - Use this report to run a listing of all owners by horse. Individual Horse Information - Use this report to run a listing of a specific horse's information from the main screen. Sales Summary - Use this report to run a listing of all horses sold, the sire and dam, the sold price and a grand total. There is one invoice report. Invoice - Use this report to select invoicing criteria for a specific horse while choosing specific billing dates. All printing is done from the reports and pedigree sections and the address book. If you want to print any of the information recorded in HorseBiz go to the reports section. Select the appropriate folder and review the reports. You can print out any information within HorseBiz by selecting the appropriate report. To print out a pedigree go to the pedigree section. If you want to print out an address book listing go to the address book. 1. Press the 'Print Screen' key on your keyboard. NOTE: Nothing will appear to have happened, but HB has captured the screen and sent it to the Windows clipboard. 2. Open your word processor, for example, Microsoft Word. 3. Start a new document. 4. Use the paste command within your work processor program. The "screen shot" will be pasted into your work processor. You may now print with screen shot. Registering your copy of HorseBiz is easy. Then you first start HorseBiz a registration screen will appear giving you the choice to register over the internet or by mail. To stop the registration screen from coming up each time you start HorseBiz click the box in the lower left hand corner of the first registration screen. You can also call 281-677-8964and have the following information ready. Your first and last name, address, phone number, email address and your HorseBiz license number. You can access your registration information at any time by clicking on Help/Registration. 1. It will allow us to give you free technical support. 2. It will allow us to contact you when updates are available. We never sell the names of our registered users. HorseBiz offers an easy way to backup your valuable horse records. We recommend that you backup your records at least once a month. 1. Click on the Backup icon. 2. Select the Drive and Directory you want to backup your files to. 3. Click the 'Click Here To Begin Backup' button. There are two data files, HB.mdb and Pedigree.mdb which will be copied during the backup procedure. 1. If possible go to the Control Panel and un-install HorseBiz. 2. Locate your original HorseBiz CD and insert it. 3. Follow the directions on your screen and re-install HorseBiz. 4. If you have received HorseBiz updates install them now. 5. After the installation is completed locate your HorseBiz Backup disk(s). 6. Insert your HorseBiz Backup disk(s) into drive A. 7. Use Windows Explorer to locate the HB.mdb and Pedigree.mdb files, then drag and drop each file into the C:\Program Files\HorseBiz directory*. HB.mdb and Pedigree.mdb files into that directory. Batch entries are an easy way to enter many horse's records at the same time. For example, if the vet comes out and worms 10 of your horses you do not have to enter a vet record for each horse, instead use the batch function. Click on the batch entry icon and the batch entry window will appear. Select the horses you want to enter a record for. Select the kind of record, activity, farrier, show, training, or veterinarian and click OK. Now enter the record as normal. When done, click the Exit Batch Entries button and select a horse to work with. Use the address book to keep track of your clients, farriers, owners, trainers and veterinarians. To open the address book click on the icon. When the address book opens you will see a summary of all the contacts and their basic information that you have entered in. You can quickly look up a contact's home and business phone number here. To add a new contact click on the icon. To see detailed information on an individual contact, double click their name. This will also put you into edit mode. Three folders will open containing personal, home and office information. You can review and edit the contact's information here. In the personal folder there is a Groups Section. You may add a Contact to as many groups as you want. For example, your veterinarian might also be a client of yours. To delete a contact out of the address book highlight the contact's name and click the icon. To print out a phone list click on the icon.